Hello, I’ve missed you! I have recipes! With really, really, really bad photos!! In fact, the photos are so bad I’m ashamed of them, especially as someone who has urged you to keep up on my life if you’d like to by going to my photo blog, though I tell you the photos there are of a little higher quality. I’ve been doing a lot of things, and even posting regularly (though perhaps not as personally) on my photo blog, but I sure haven’t been posting here, have I? I’m not going to make any promises that I’ll be posting regularly now, but I did make a dish or two last night I liked enough to want to record, so here I am. And what have I been doing with my time instead of cooking magnificent, blog-worthy food? A lot of wildlife volunteering, of course. I have regular shifts at two different wildlife hospitals here, which I absolutely love. It’s very interesting working in two very different places, and it’s going to be REALLY interesting in the next month or so when baby wildlife season starts. I have so much to learn, especially about all the non-raccoon and non-raptor species as well as the differences between Virginia and California species. I’m interested in caring for all animals, although both hospitals are aware of my special interest in both raptors and rabies-vector species and I’ve have started working with the education raptors (and other species) at one of the hospitals and have been handling rehab raptors at the other. California seems to be a lot more rehab-friendly than Virginia was and my volunteer work here has been my favorite thing about California. It’s really great. My next favorite thing about California is NATURE. It took me a while to get used to the parks here as they are very different than Virginia’s parks, and arriving during the middle of summer AND a drought was probably not an ideal introduction. All the parks were dry, brown, hot, hilly, open, and apparently devoid of wildlife when I first got here. As it turns out, though, winter in California is a magical time. I despised winter in Virginia, but in California, everything turns green – and not just an ordinary green, but a GLOWING green – and thousands and thousands of raptors migrate through here: the parks have become extremely beautiful and I don’t know if there is just more wildlife this time of year or if I’ve gotten luckier, but I’ve started to see so many more animals that it may be even better than Virginia. Plus the weather is amazing: comfortable temperatures and NO SNOW. The San Francisco Bay area is a very populous, congested area, yet there are so many parks and open spaces, it’s pretty amazing. I typically go hiking several times a week and don’t repeat many parks all that often, and I have a thick folder full of used park maps, and there are still many I haven’t yet been to. Also, I stare at Google Maps a lot looking for green areas to explore, and yet, nearly every week I talk to someone who mentions some park I’ve never even heard of. It’s really pretty incredible. I LOVE it. Last, but not least, is friends. I don’t have that many here, but some of my very old friends are coming to me. 🙂 Our good friends Brad and April moved to the Bay Area a few months after we did, which was SO GREAT. And at long, long last, Fortinbras has FINALLY made it back to California. He moved to LA just a couple of weeks ago. I wish he was closer, but LA is way better than Baltimore, and we are driving distance from each other, if not pop-by-on-a-whim close. He drove up here the week before last, which was the first time I’d seen him since I left Virginia in July. 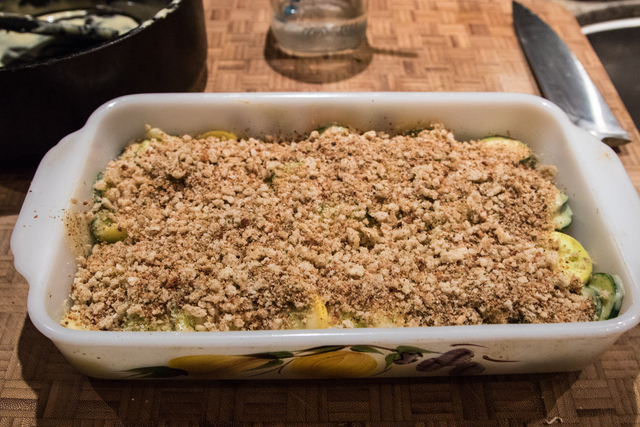 He’s actually the reason for my first recipe today because he bought a bunch of zucchini and yellow squash while he was here and we didn’t eat all of it, so a few were languishing in my fridge and needed to be used up. I’ll typically just lightly saute zucchini and top with a flavored salt, but though he’ll eat that, Mark tends to take only a few slices and I’m always harping on him about eating more nutrients, so last night I had a little more time for dinner preparations than I usually have and I tried to think of something different to do with the zucchini and squash that might appeal to Mark. I decided to make a gratin. 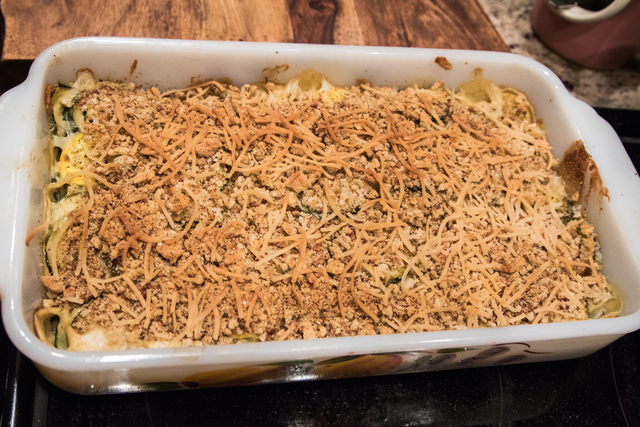 I’ve made gratins in the past, often relying on the gruyere recipe in Artisan Vegan Cheese, but I’ll be honest with you: I haven’t made fermented cheese since I moved. I keep wanting to and not finding the time. What I have been making a lot of, though, is various cheese recipes by Lacey at Avocado and Ales. Lacey left me a lovely comment on my last post so I checked out her blog and found she’s pretty amazing. (Lacey, if you are reading this, I tried to leave you a comment telling you that but I had issues doing so and I don’t know if you ever saw it.) 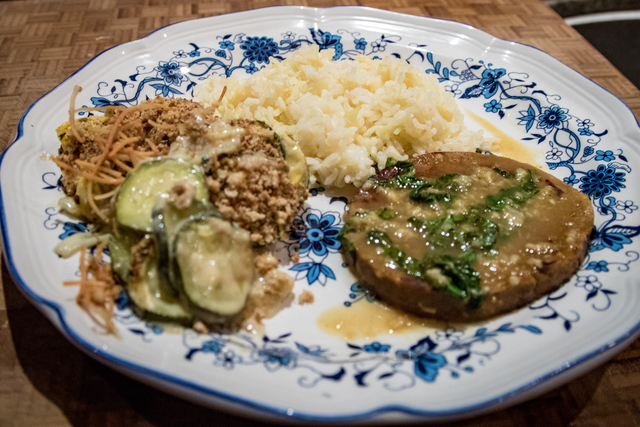 So when I googled around for gruyere ideas and found a recipe (that I think was adapted from the original vegan cheese bible, The Uncheese Cookbook, which you would THINK a vegan of as many years as me would own but I for some reason do not), I took a tip from Lacey and replaced the acid with vegan lactic acid powder. I don’t think I’ve ever actually had real gruyere cheese if you want the truth, but I thought the resulting sauce was pretty tasty. Also, she didn’t write this particular recipe, but you should really check out Lacey’s recipes – I’ve quit buying Daiya mozzarella and just make her mozzarella, which I prefer, on pizza, and her vegan cheddar sauce is really great. Pre-heat the oven to 400 degrees. If you don’t have pre-made bread crumbs, make some first so you can work with a dry blender or food processor: toast about 3 slices of white or whole wheat bread until they are quite dry, then roughly crumble into a dry blender or food processor. If you’d like, add some seasonings: I added a little vegan chicken broth powder, salt, and dried parsley. Process until you are left with small crumbs and set aside. Next make the gruyere sauce by placing all ingredients in a blender or food processor and processing until smooth. Pour into a small saucepan and heat over medium heat, stirring until sauce is smooth and thickened. Set aside. Slice the zucchini or squash and the onion, then heat a little oil over medium heat. 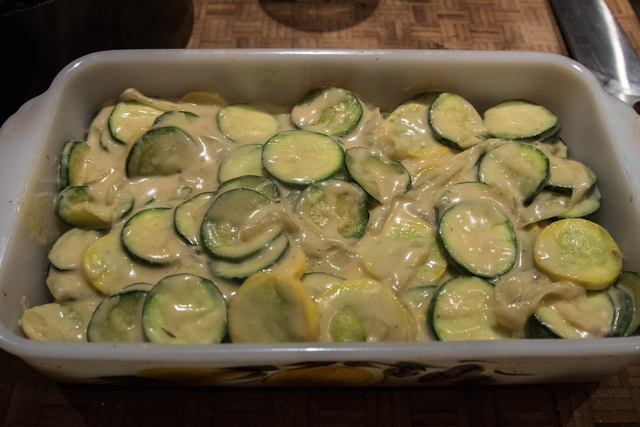 Add the onions and cook until soft, then add the zucchini and squash until they are lightly cooked. 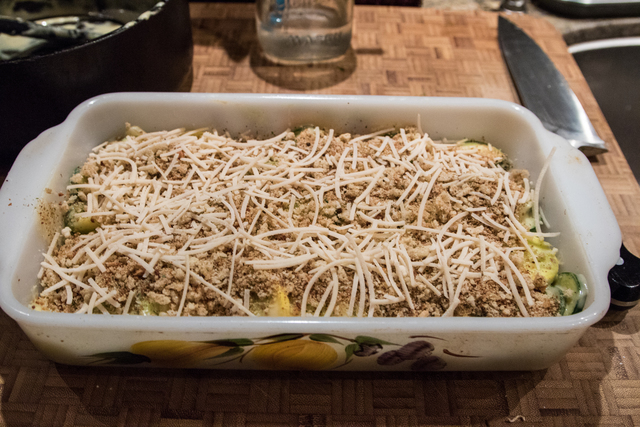 Pour the gruyere sauce into pan and mix everything up, then pour the mixture into a medium baking dish. Sprinkle the bread crumbs on top. If using, top with vegan parmesan. I just happened to have seen Follow Your Heart’s shaved parmesan for the first time the other day and bought it out of curiosity, so I used that, but I don’t generally buy or make vegan parm and if I hadn’t had it, I would likely have generously sprinkled Dragonfly’s Bulk, Dry Uncheese, which I always have on hand and use for all my powdered or sprinkly cheese needs, on top. Bake for 20 minutes, remove from oven, and let sit for 10 minutes before serving. 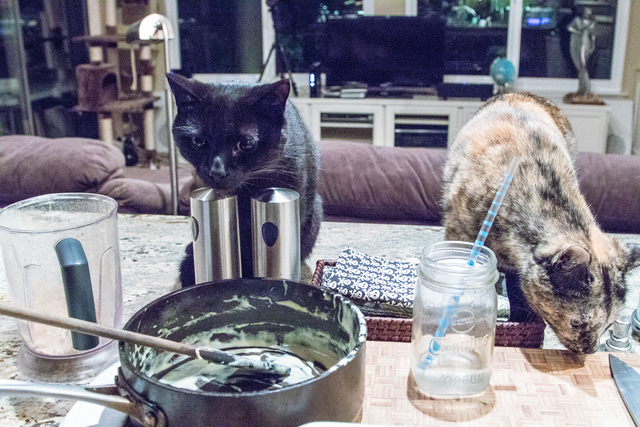 They are so cute and SO annoying when I’m cooking. Mark’s thoughts on the gratin? He liked it a lot. He declared himself a “foodie”, closed his eyes and said he tasted hints of “berry”. I said that was absurd, to which he commanded, “Silence! Do not contradict the foodie!” In a slightly less silly assessment, he said it was both creamy and crunchy and he enjoyed that dichotomy. He also ate all of what was on his plate and didn’t make a single complaint about the fact it was squash, which he ordinarily has very mixed feelings about. Success! Mark suggested that I also post the recipe for the seitan I served, which I agreed to do because it gives me a chance to talk about my brand new Instant Pot, which I’m excited about. I’m a little late to the Instant Pot game, which is surprising because I love kitchen gadgets, but with my move last year to California, I spent the first half of 2015 purging as many material items as I could from my life and not buying anything. And the second half of 2015 found me needing to be extremely frugal because CALIFORNIA IS EXTREMELY EXPENSIVE. I’ve had my eye on an Instant Pot for a while, though, because although I managed to cram all my appliances into a kitchen that is much smaller than my previous one, several of them, such as my dough mixer and slow cooker, were inconvenient to use, and I had dreams of replacing the slow cooker and rice cooker with the Instant Pot to free up some space and make all of the appliances easier to reach and use. And then my stovetop pressure cooker stopped working properly – it would maintain pressure, but release a lot of steam while doing so. Now, I won’t lie to you: I probably just needed to replace the gasket, which would have been the cheapest solution, but I instead decided to take that as a sign it was time to indulge in the Instant Pot. And I’m really glad I did because I know it’s going to get a lot of use and now my dough mixer is going to be a lot easier to use from its new location on the counter. I had started getting back into baking a little bit when we first moved and I had some time (before I was able to start volunteering again), but I’d gotten pretty lazy about it partially because the mixer was just inconvenient to use. And another thing I’d been lazy about was buying and stashing a bunch of Gardein products in the freezer, which is NOT a frugal move. I should have been making my own seitan more regularly, but my preferred method for that was steam-then-bake and my slow cooker/steamer was also inconvenient to get to so I tended not to do it. Then I thought about returning to my previous favorite method of seitan making, which was pressure cooking, but my pressure cooker was getting on my nerves. ENTER THE INSTANT POT, in which I can steam OR pressure cook the seitan – though I’ll tell you now I’m pretty much always going to pressure cook it. For pressure cooking, the Instant Pot is far superior to a stovetop pressure cooker, because you can set the timer and just walk away – in fact, I could leave the house if I wanted to. (And the weather in California is generally so glorious I USUALLY want to leave the house.) PLUS there is none of the really annoying “run cold water over the pressure cooker to bring the pressure down” nonsense I was always doing with the stovetop cooker. I’m not yet sure about making rice; I doubt it’s going to be easier or better than my high-end fuzzy logic rice cooker, whose place its taken on the counter, but I also didn’t get rid of the rice cooker and I intend to bring it out of the cupboard when I want to cook something in the Instant Pot AND have rice, which I think might be rather often. Basically, though, I convinced myself I’m going to save tons of money on bread and fake meat by investing in the Instant Pot. Hopefully that’s true. 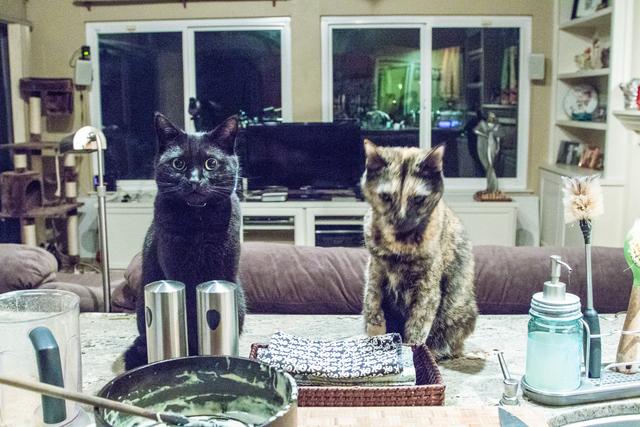 I’ve already baked a couple loaves of bread – the bread crumbs in the recipe above? Made from homemade bread. I will also hopefully use the slow cooker feature much more often than I was slow cooking before because I am very often not home during dinner-making hours, usually coming home starving and throwing something sub-par together as fast as I can. So that’s my Instant Pot story. If you have favorite Instant Pot tips and recipes, please share! As for the seitan recipe, generally when I want to make seitan of any type, I’ll google Vegan Dad’s lunch meat recipe to get the basic ratios of beans/liquid/vital wheat gluten (though you’d think I’d have it memorized by now), then I season it however I’m in the mood for. Previously I would steam and bake as Vegan Dad instructs, but now that I again have a reliable pressure cooker, I’ll be doing that as it takes half the time and is in my opinion easier. Something that I’ve been doing for a long time is cooking large batches of dried beans and freezing them in 1-cup portions to be used for seitan down the road. I’ll be able to either slow cook or pressure cook these beans in the Instant Pot from now on. To make the seitan, add all ingredients except the vital wheat gluten to a blender or food processor and process until smooth. Measure the vital wheat gluten into a large bowl, then pour in the liquid and stir with a wooden spoon, or just mix with your hands. Lightly knead until entirely mixed. Form the mixture into a log shape. Take a large piece of clean cheesecloth or muslin and roll the seitan up like a tootsie roll, tying the ends with kitchen string. Place in a pressure cooker and cover with water or vegan broth. (I used plain water but salted it generously.) After bringing up to pressure, cook for 50 minutes to one hour then release the pressure naturally. (I kept my Instant Pot in “Keep Warm” for 10 or 12 minutes, then moved the valve to “Venting” to release the remaining pressure.) After removing it from the pot, you can unwrap the seitan at this point, but let it completely cool before slicing or using. In fact, the seitan is best used the next day after firming in the refrigerator overnight, though you can use it as soon as it is cool. For the Lemon-Basil sauce, slice as many pieces of seitan as you want and pan fry them in a pan large enough to accommodate them, then remove from the pan. In the same pan, pour a little olive oil, add the garlic, and stir a couple of times, then pour in the broth and lemon juice and zest. Bring to a boil, then reduce heat and simmer until reduced to one half or one third of original volume. Add the basil and stir, then return the cooked seitan to the pan, coat with the sauce, and re-warm. Serve. I served mine with the gratin above and rice made with vegan chicken broth in the Instant Pot.